10 Things You Need To Know About Samsung Galaxy Note 9! After recently launching its first set of flagships for 2018, Samsung is gearing up for its next flagship release in their most-anticipated Note series. The Samsung Galaxy S9 and S9 Plus are being considered among the best Android flagship devices available in the market as of now. As per a report, the Galaxy Note 9 will break the Note series tradition and launch a bit ahead of its regular schedule this year. 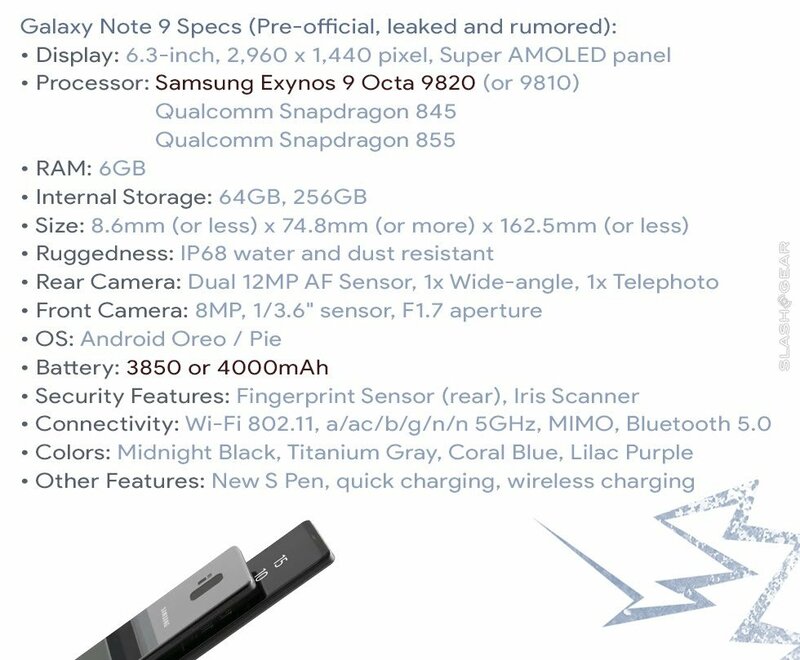 But, as is the norm nowadays, all the specifications and features of upcoming Samsung Galaxy Note 9 have been leaked by an anonymous source. It was leaked on Twitter that the Samsung Galaxy Note 9 will feature a humungous 6.4-inch display instead of the 6.3-inch screen on the current Note device. Note 9 has been leaked a number of times in the past, but the latest leak confirms a number of features and specifications. As per the reports, Samsung Galaxy Note 9 will launch in the third quarter of 2018. The Samsung Galaxy Note 9 is expected to come with a 6.4-inch AMOLED widescreen 18.5:9 display. The Galaxy S9 Plus and the Galaxy Note 9 will have very similar displays. But traditionally the displays on the S-series smartphones are a bit more rounded than those on the Note series smartphones. The upcoming Galaxy Note 9 will pack in a bigger battery. The Note 9 will see a substantial upgrade in terms of battery and battery life. The Note 8 came with a 3,300mAh battery unit. But as per a leak, the Galaxy Note 9 will come with a larger 3,850mAh or 4,000mAh battery. This one is a no-brainer. Just as the Samsung S9 siblings, the Galaxy Note 9 will get powered by the same flagship processor from Qualcomm, the Snapdragon 845. In India however, the Note 9 will be powered by Samsung’s own Exynos 9810 SoC which is equivalent to the Snapdragon 835 in terms of power, performance and efficiency. The Samsung Galaxy Note 9 will feature 6GB RAM with two storage options of 64GB and 256GB. The recently launched S9 smartphones are also available with similar storage variants of 64GB and 256GB. The upcoming Galaxy Note 9 will ship with a rear dual camera setup at the back. At the back, the device will pack two 12MP cameras. There will be one wide-angle lens, while the other will be a telephoto lens. There’s also a possibility of it featuring the same mechanically adjustable aperture like Galaxy S9 Plus. Up front, the device will come with an 8MP shooter with a f/1.7 aperture. The device will run Android Oreo 8.1 out of the box. The Samsung Galaxy Note 9 will run Samsung’s latest TouchWiz UI based on Android Oreo, with the latest upgraded Bixby smart assistant baked in. The under-display fingerprint sensor has been rumoured for a number of times in previous Samsung devices. So far, we haven’t seen anything from Samsung with the technology. And it seems that the Note 9 will also miss out on the under-display fingerprint scanner. Samsung has claimed in the past that they will not include the technology until they have perfected it. The Samsung Galaxy Note 9 will feature an iris scanner and an advanced facial recognition technology for enabling options for biometric locks. The smartphone will ship with IP68 certification for water and dust resistance. As per the leak, the Note 9 will support the advanced high-frequency antenna for upcoming 5G connectivity. The device will pack in a high-speed LTE modem, called the Snapdragon X24 to support Gigabit LTE. The upcoming Galaxy Note 9 will be at par with the recently launched Galaxy S9 and S9 Plus, just in a bigger size. Compared to Note 8, the successor will use a larger battery, a better hardware with a few upgrades. "10 Things You Need To Know About Samsung Galaxy Note 9! ", 5 out of 5 based on 3 ratings. Top 8 Smartphones Launching This August in India!